Yesterday we went to the hospital to visits the families and we had a few appointments. Riham’s mother was already at the entrance of Riham’s room waiting for us, and wanted to know for sure if Riham was going home. We assured her that we will take Riham to the house but she first needed to be trained to feed Riham by nasal tube. So I asked the nurses to train her and give her all the details she needs to know about Riham. Mom took it very well and was very cooperative to be trained. She cares for Riham and shows her much love. At the end of the day we brought Riham and Mom back to the house. In the evening we had a lovely farewell party. We sang songs, showed pictures, shared words of encouragement and enjoyed a lovely biryani meal which was made by the mothers. Today Mom had a outing together with a few other families. They went to Jerusalem and saw places where Suhail shared God’s Word with them. Riham stayed in the house because she needs a lot of care. She had her private nurse Svea, who took great care of her. 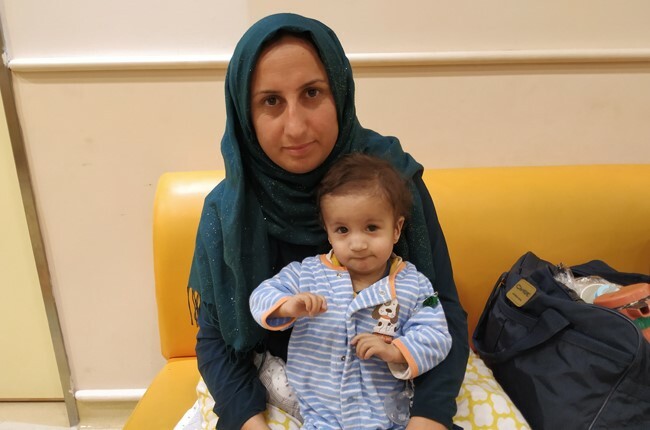 Tomorrow Riham and her mother will go home. We are sad to let her go and are also worried about her future. Riham needs a lot of care because she has severe brain damage. She needs a lot of medicine and is dependent on feeding by a nasal tube. We pray for her and for the mother. May God give her the strength and the time to look after this precious girl. We lift them up before our Lord and Savior. Today we visited Riham and her mother. The last couple of weeks have been very difficult for Mom. She had panic attacks with vomiting, dizzyness and headache. At times it was heart breaking so see Mom being so desperate. But today when I visited Riham and her mother, she was smiling and telling me that she was okay. I was so pleased to see her in a good spirit. We have been praying a lot for her and Riham. 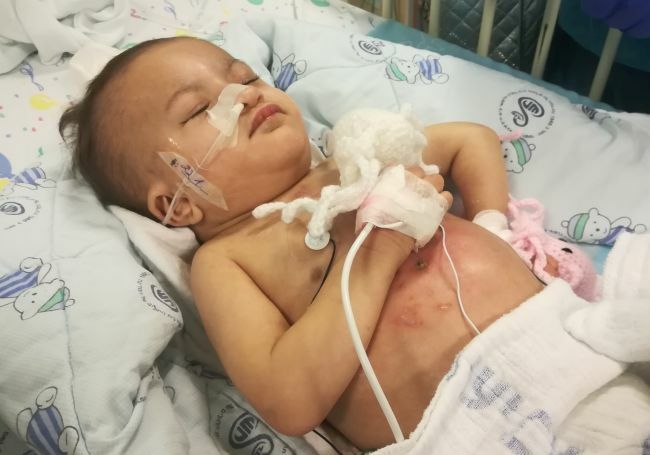 Riham has a pacemaker but there has been an infection. She also can’t swallow because of brain damage and is depending of feeding by tube. She therefore has a nasal tube but the nasal tube can o my be used your several months. If she depends on this feeding than she will need a PEG tube in her abdomen. The pacemaker sits than on the wrong place. This replacement of the pacemaker is needed to be able to place the PEG tube. She therefore went for surgery. She did well and after two hours she was back in ICU. We pray that she will recover well. She also had a cold and runny nose. She is so adorable and it’s so sad to see her helplessness. May God restore her to show His power to all of us. Today, our little Riham still fought the infection of her stomach. The doctors even considered doing a surgery. When they drove her into the first room of surgery, they examined her again to be sure, and then God intervened. They found out that the infection has already gone down, so they did not have to operate her. Praise the Lord! 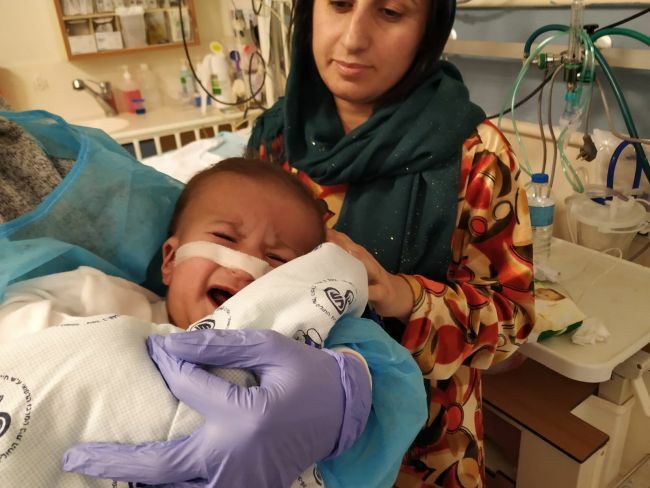 Her mother also was really peaceful during all the day and was also really happy not to have any operation again for her precious daughter. May God continue to bless them and show them his will in all the small and big decision which has to be made in Riham’s life. May His will be done. As I stood comforting Riham today I was so struck by how much I could feel God’s love for her. She is so small, so sweet and so innocent and she is a treasure to her Heavenly Father. He loves her so much that He sent His son to give His life for her. This is amazing. At a time when many things are so broken for Riham it seems important to remember that our God is the defender of the weak, he is our safest dwelling place. 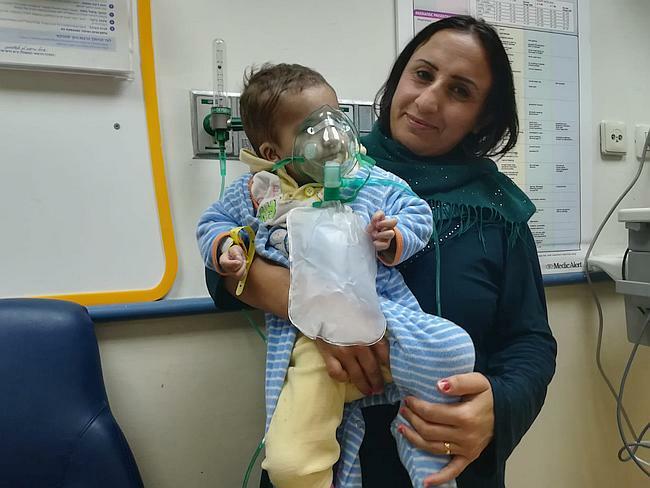 Riham’s mother is finding hospital very difficult and sometimes being in the hospital setting can make her feel very unwell. 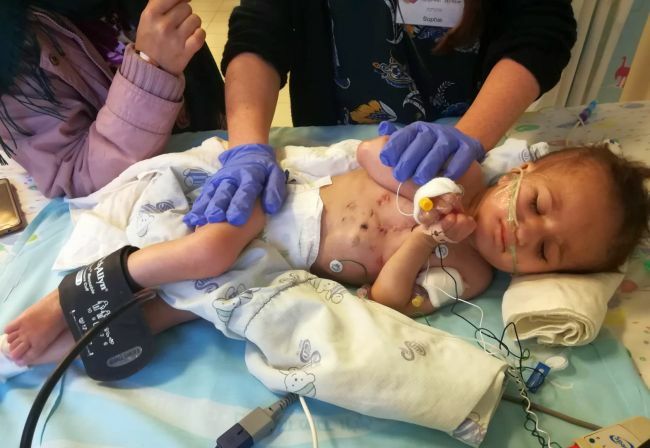 Please pray for Riham’s mum that she would feel the love of God and pour this same love over little Riham. 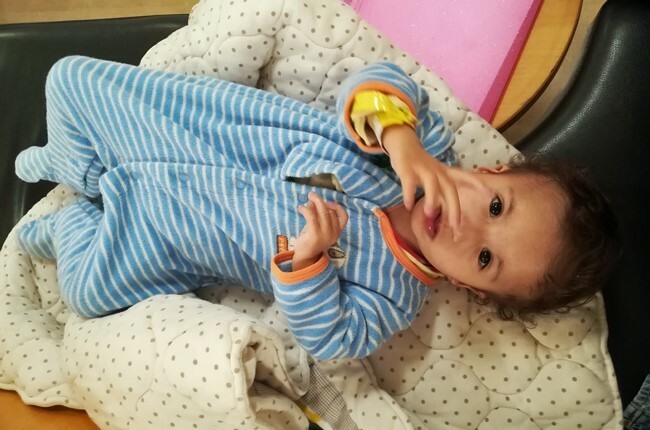 Riham is currently stable although faces many challenges. She has lost a bit of weight which is worrying when she is already so small. 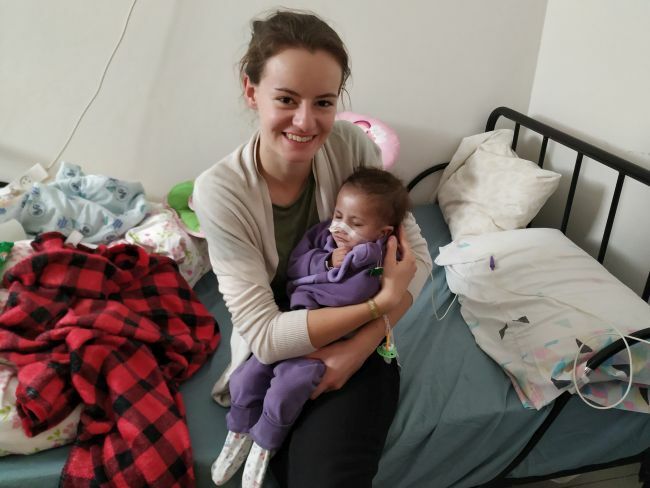 She is also making repetitive and constant movements with her arms and legs and needs a lot of massage and careful positioning to try and allow her body time to rest. Please pray peace and healing into Riham’s body. Pray that she feels loved and held tightly in the arms of her father so that she has peace. Sometimes God just presents someone with an inner peace. This day, we had the pleasure to experience His peace in Riham’s mum. After struggling with so much pain and anxiety, she was in quite a good mood today. We chatted, laughed and really enjoyed the time together. It filled us with joy to see especially her in this mood, considering the nerve-wracking time she is going through. Unfortunately, in the afternoon Riham was not doing well. She had inner bleeding, also her diaper was full of blood. The doctors were not sure about the reasons of it, so they decided to do a CT-Scan to find out about it. Following the CT-Scan they decided to do an endoscopy. All of a sudden, there was a big rush. Many doctors were around her and they even considered doing a surgery to open her stomach and fix everything. Praise God, Riham’s mum herself was surprisingly calm and peaceful during this time. She sat together with Sophie, chatted and called her family in Kurdistan. And then finally, good news came! 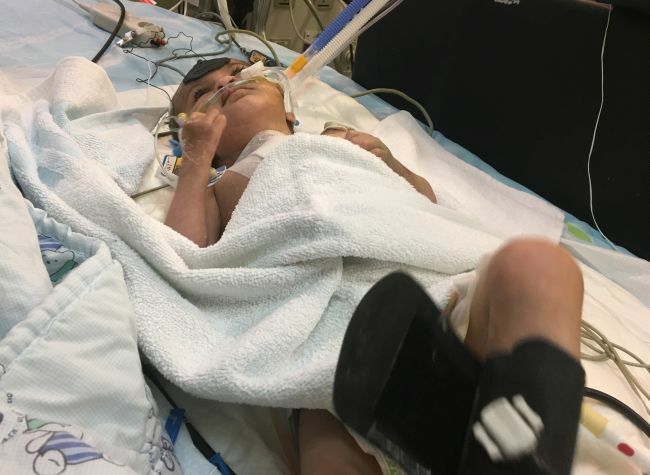 So far, Riham won’t need another surgery. They will take it slow and first monitor her condition for a while. If her condition worsens, they will do another endoscopy or try other procedures to avoid a surgery. It’s so touching to see God working in the hardest times. 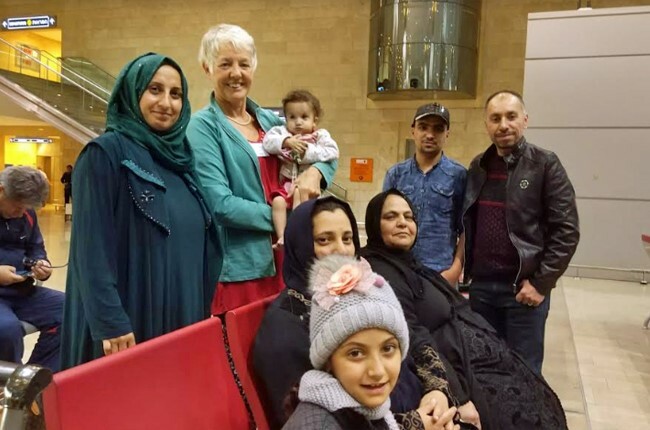 Please pray for his work continuing in Riham and her mother’s life. May He comfort her again with His inner peace and hope. And for little Riham to overcome all this pain and struggle. May He be glorified in their lives! 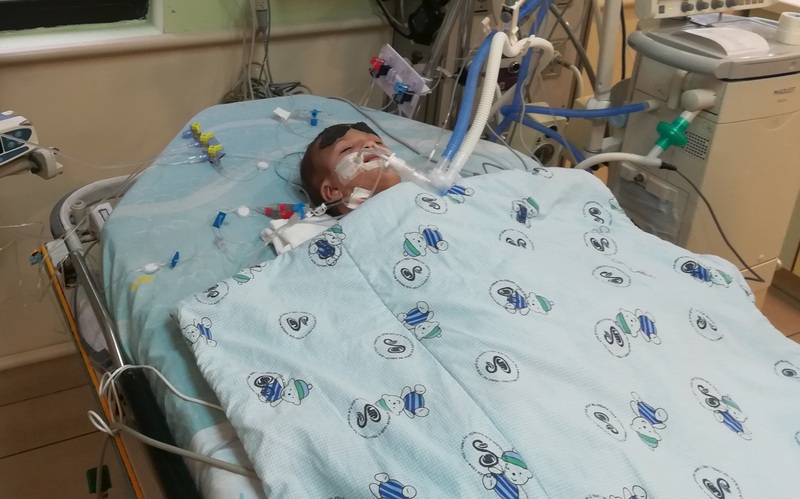 The situation in Riham’s intensive care room was tense and somber today. 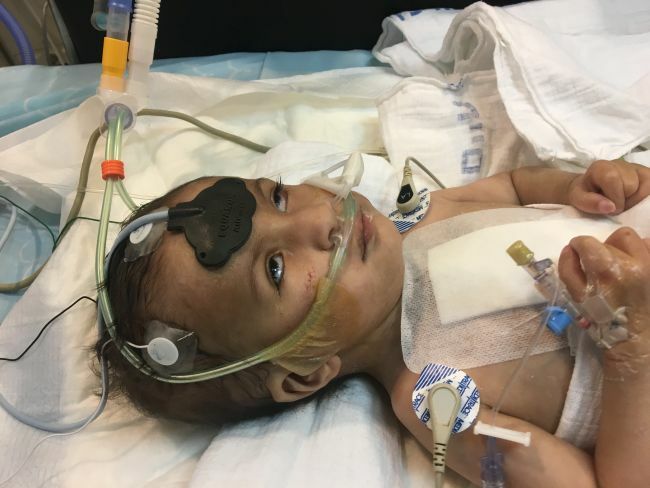 Riham had another visit by the neurologist and the news was not good – she has extensive brain damage from her extended CPR. Her situation looked bad, her eyes were rolled back in her head and she was having convulsions after being taken off the narcotics. However, the young brain is amazing and incredible feats of recovery are possible, and we are faithfully expecting a miracle in this case. The mother was very tired and restless, so we took her for a walk and tried to encourage her as much as we could. 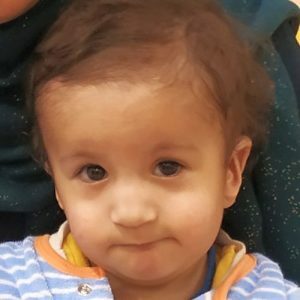 Please pray for the mother’s comfort, and Riham’s complete healing. 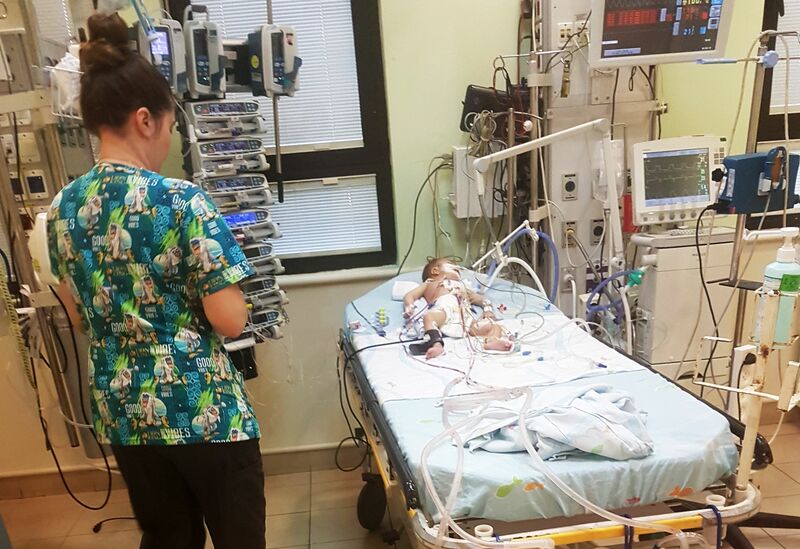 Today when I came into the ICU, the nurses were preparing little Riham for surgery. After she was in the surgery room I went outside with her mum to get some fresh air. Her mom was peaceful but also very worried. When we came back to the waiting area she put music on and started to pray for her little daughter. It was a lot of waiting. During the surgery Riham’s mom coped with it okay. Finally the surgeon came out and said that everything went well and that they did the pacemaker and fixed something else in her heart which they didn’t see before. After the surgery it took them some time to stabilize Riham. Please pray for Riham that she will recover soon from the surgery. And please also pray for her mother to have strength to be strong for her daughter. Riham had a few difficult days. Last Friday she was extubated after surgery, but because of pulmonary edema they had to intubate her again at the night. Today when we visited, she was still intubated. They did an echo and said that it looked better. The nurse said they will also start with giving some food. Riham was very cyanotic before surgery and now her skin has a nice pink colour. She is so tiny although she is already two years old. Mom is doing well. The families at the house gave us some clothes to pass on to her. She was pleased to see us and we spend some time with her. Please pray for the lungs and for full recovery of her heart. Anna and I arrived at the hospital to find mum in the waiting room, not frightened but rather joyful that her little girl is finally having the surgery. She has been waiting two years for Riham to be well. The surgery was a success. 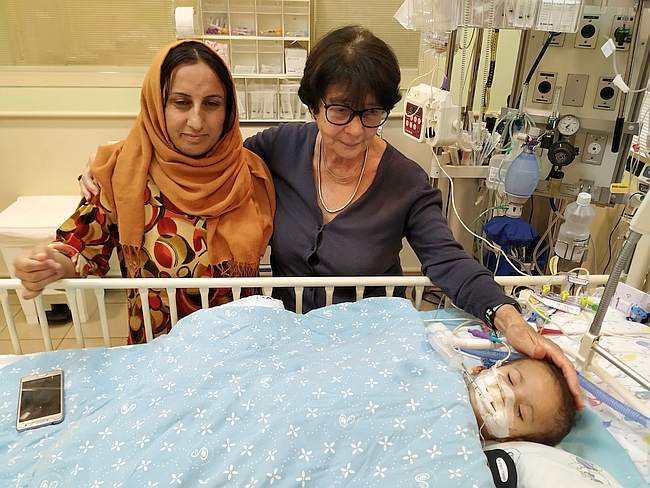 The doctor said that there is now a problem with the electricity of Riham’s heart, and she is connected to a pacemaker whilst she is monitored over the next week. It is possible that she would need to have a permanent pacemaker if the situation does not improve. 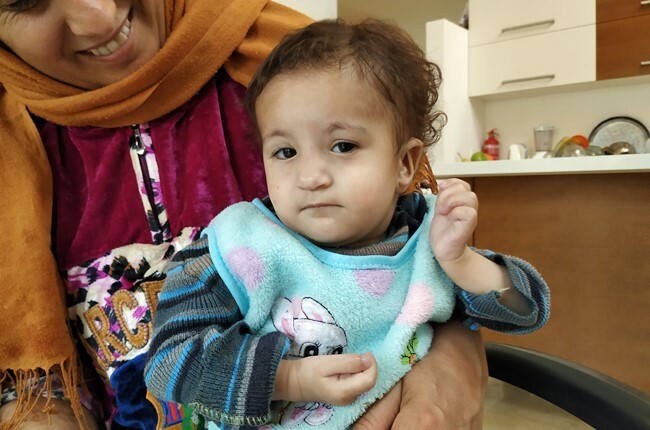 Riham’s mother was able to breathe a happy sigh of relief when she saw her after the surgery. 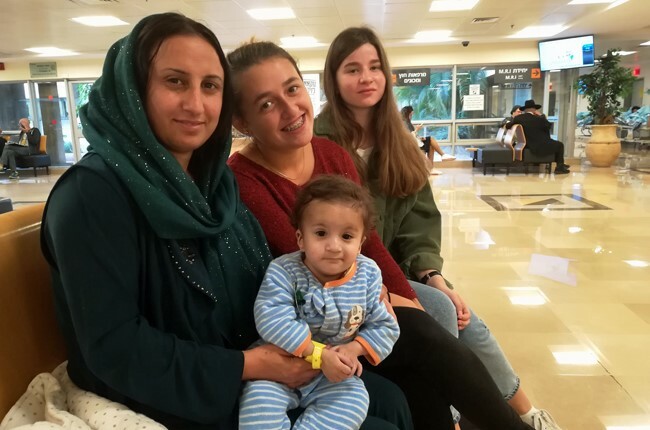 The doctors made use of the Arabic speakers amongst their staff to ensure that mum had translation for all the information following the surgery. Please pray for Riham as she recovers this evening and overnight. 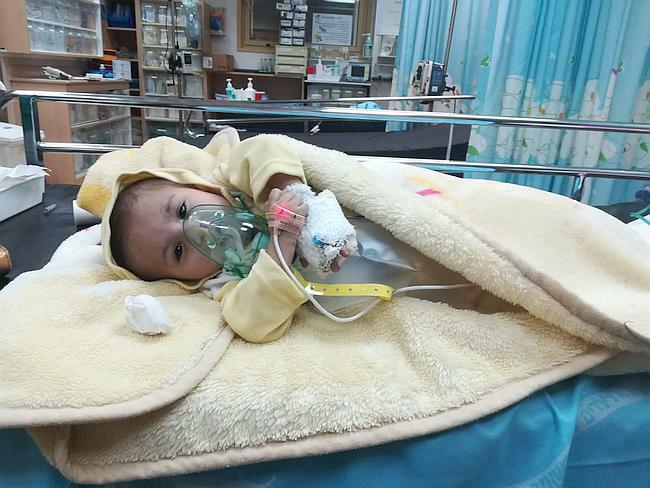 Recently arrived Riham has had such wildly-varying oxygen saturation levels (from 30-60% of normal) that our team brought her to the emergency room at the Sheba Medical Center today for further assessment. With her heart condition, a child can suffer a cyanotic spell and quite possibly die at any time. Doctors are hoping to take her to surgery as soon as possible; let’s keep her before the Father. Little Riham had an early start this morning, for her CT scan. This was requested by the cardiologist at her echo yesterday, to look at the stenosis in her heart. She is so smiley and sweet towards us, and she didn’t cry whilst she waited even though she had been fasting since the night time. The CT scan was straightforward; we don’t know the outcome yet though, and the medical team will be in touch about the next steps. Mum was a little tearful as she waited for Riham to come out of the CT scan, and also as we waited for Riham to wake up from the anaesthesia. Please pray that the surgery will be scheduled soon for Riham, and that the Holy Spirit will fill her, and bring her life. She is ever so tiny, surprising everyone who learns that she is 2 years old! Her fingers are long and beautiful, but so blue on the ends. She is a concern for us all, but we have faith that God will bring her full healing, and life in abundance. This morning Riham had her first appointment at the hospital. It was an early appointment, so we had to leave the house at 7.00 am. Riham was still asleep when I had to picked her up from the cot. She was awake while driving. She was happy. Looking at Mom and smiling. In the hospital they did the echo, ECG and saturation. Riham is malnourished. She is two years old but her weight is only 5.5 kg (12 pounds). She can’t sit or crawl yet. She is only fed by milk because her body seems not to cope with other food. Although we have to look into this, for now our first concern is the heart. Because there is also a stenosis, she will have a CT scan tomorrow. After that the operation will be planned. With lovely Kurdish children songs on the phone, Riham did very well during the examinations. Mom takes good care of her. Please pray with us for this tiny little girl. May her body be strong enough for the big operation! 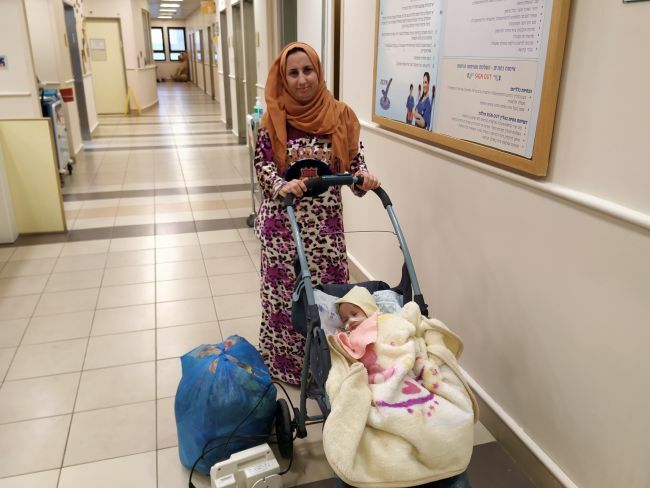 Last night little Riham arrived in Israel after a two day journey. She was restless and cried a lot. She came with her mother, who was tired too because of the long flight. On our way to the house Riham was not happy and Mom tried to calm her down. Riham is two years but very tiny for her age. She has a severe heart problem called Tetralogy of Fallot. Mom is sweet and cares for her little one. Please, Lord, take care of this little one and may she be blessed with a new heart and a bright future in front of her. We commit her to the Lord. 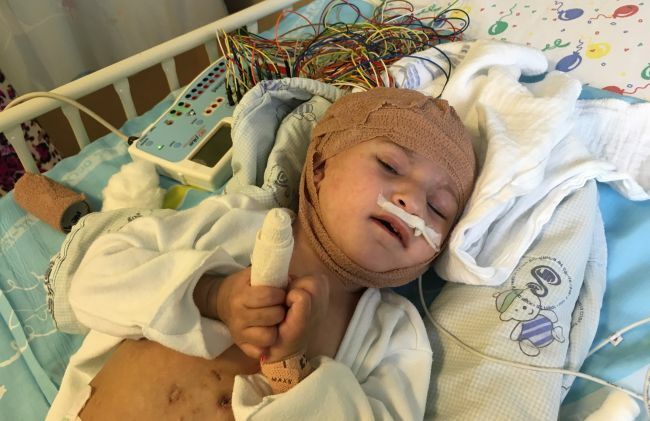 As of right now, Riham still needs $9982 toward surgery and related expenses.